Check out this week’s Nike+ Run Club EMERGING RUNNER workouts here. Check out this week’s Nike+ Run Club ADVANCED RUNNER workouts here. Elite is not a time on a clock. It’s what happens during that time on the clock. Elite is not a medal. It’s what you did to earn that medal. Elite is not a distance. 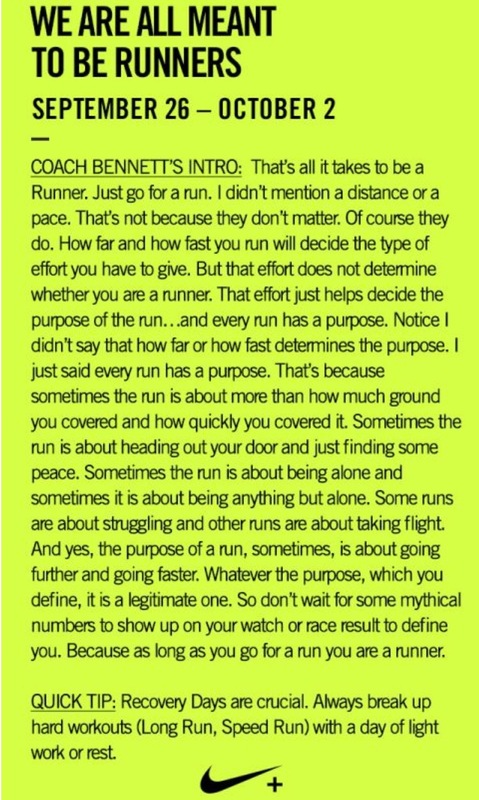 It’s about running the distance. Elite is not a finish line. Elite is not a pace. Elite is not perfect form. Elite is not a headline. It just means being the most elite version of yourself. That’s what I knew every day when I woke up. When I walked into the classroom and when I went to practice I knew it. Mr. Heath made sure of that. Because it mattered to him. The challenge was if we could care as much about it as he did. If we could do that, well, that is how one team wins 21 Meet of Champions titles. He never treated Cross Country or Track & Field as peripheral sports. To him they were the only sports. That was super important to a 14 year old deciding what sport to commit to. That mentality brought so many great runners into the program. They didn’t even know they were runners! But they wanted to be a part of something special. Mr. Heath and I didn’t coach the same way. In fact, we were incredibly different when it came to coaching. We laughed more than we argued. We had fun working so hard. The bar kept getting raised. I’ll put those last 4 years we had together at CBA up against anyone’s best 4. The greatest part was that it got harder and harder to get better and better. And that made only made it more fun for us. He didn’t need to do any more in the sport. His place on the mountaintop was earned years ago. You could add up the MOC titles of every other coach in NJ and put them in a corner and that pile would be smaller than his. And if something matters to you then dammit do it as best as you can. That’s something I remember when I think about Mr. Heath. It’s not going to be perfect. And it’s best to come to terms with that now. You are going to go out too slow or too fast or fall asleep in the middle or come up short or have too much at the end. You may cramp because you drank too little and you may cramp because you drank too much. You may be sick and feel like crap. You may be healthy and feel like crap. It’s not going to be perfect. You have weaknesses. You screw up and make mistakes. You have doubts. You get scared. Because you’re not perfect either. But you’re not doing this because you thought you were perfect. You are doing this because you know you are getting Stronger. Because you are learning every day about yourself. And you Believe you can do this. And because being Scared is OK. Being scared reminds you that you are Alive. And sometimes you need to be reminded. And you should celebrate that you are not perfect. That means you Always have something you can work on, Challenge yourself on. You know what you can be is Better. You know what you can be is your Best. You just can’t be perfect. So this mile, this run, this marathon, this journey between these start and finish lines can be Life Changing. It can be Inspiring. It can be a Triumph. It can be so many amazing things. It just can’t be perfect. It doesn’t have to be perfect for it to be Extraordinary.